Nowhere does celebrations and holidays quite like New York City. Easter is no exception. The New York Easter Parade is a highlight for visitors and locals alike. Here are our top facts about this wonderful springtime celebration in the city. Enjoy! New York’s Easter Parade takes place on Easter Sunday. This year, it’s on April 16, 2017. It’ll run from 10am until 4pm. It starts at 49th Street and travels up Fifth Avenue and on to 55th Street. Bring your Easter Bonnet and join the parade. The parade is renowned for its fantastic outfits and bonnets. You’ll see some really creative millinery on display here. Prepare to be wowed. 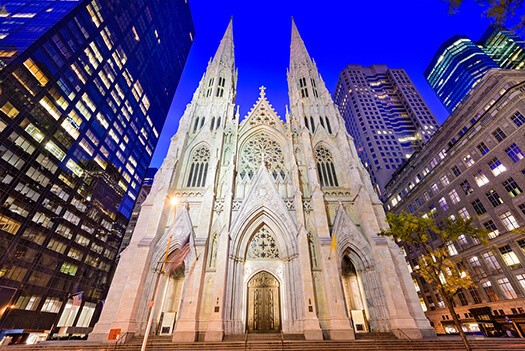 If you plan to watch, the best place to do that is around St Patrick’s Cathedral. Most of those taking part in the parade congregate here, so it’s a good place to see everything that’s going on. It’s a tradition that spans over 100 years. The Easter Parade started over 100 years ago in the mid 1800s. High society ladies would use the opportunity to don their best outfit and bonnet, and show them off, after attending an Easter Sunday service. See the start of the Easter Bonnet Parade at St. Patrick’s Cathedral NYC. Don’t miss the Easter egg hunts in and around town. If you are in town over Easter, there are a few other traditions to check out, as well as the Easter Parade. If you are visiting New York City with children, then the Barnyard Egg Hunt at Queens County Farm Museum could be just the ticket. This is New York’s oldest and continuously farmed site. Tickets are limited so you’d need to book in advance. There will also be Easter egg hunts throughout the city – including at Riverside Park. Check out Macy’s Flower Show. If your are in the city prior to Easter, then from March 26, for two weeks up until the week before Easter, there will be a beautiful floral display in Macy’s. Chances are you will be headed there for a little retail therapy and if that’s the case, you are in for a treat. The theme for this year is ‘Carnival’. So much work goes into these displays. It’s a beautiful sight and it really usually means that spring is here. Planning to visit New York City? If you are planning to visit New York City, one of the best ways to see the city is via the Gray Line New York Hop On Hop off bus tours, or ferry tours. They cover the whole city, all the major sites and are very flexible and cost effective – giving you up to 72 hours of travel around the city. 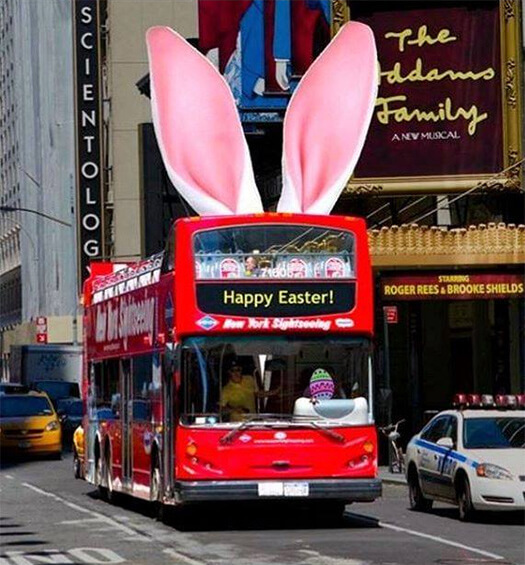 Check out our 72 hour or 48 hour hop on, hop off tours or our freestyle pass of New York which includes 72 hour access to our tour buses, a free night tour, and admission to 3,5 or 7 of the city’s most popular attractions. In the meantime, check us out at our website or at our Instagram, Facebook or TripAdvisor pages. The Gray Line NYC team hopes to see you soon!